Home Body Armor Materials How Do You Make a Bulletproof Vest? In this article we answer the question of how to make a bullet proof vest. How to construct a bullet proof vest? Since we get this question a lot, we decided to put together this little primer to answer the question how to make a bullet proof vest? How bullet proof textiles and clothing are made is really quite fascinating. In order to make any clothing you must first have thread. The threads that make bullet proof textiles are products like Kevlar®, which is produced by spinning a solid fiber from a liquid chemical blend. Another thread called Dyneema®, is manufactured by means of a gel-spinning process that yields a soft, flexible fiber that is 15 times stronger than steel. Teijin Aramid is currently developing a new ultra-microfiber that is strong enough to make bulletproof vests that are stab-proof as well. Teijin is also hoping to reduce roadside bomb injuries with vests made using their new ultra-fine fiber. If the fibers used in protective vests are extremely fine, the gritty particles blasting out from these bombs won’t be able to penetrate and cause injuries. 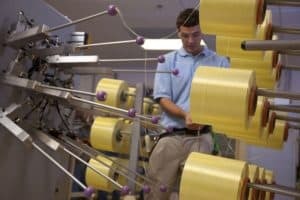 U.S. Air Force scientists at the Air Force Research Laboratory are now trying to develop an artificial silk for use in manufacturing of body armor. It would have the same temperature regulation properties found in natural silk, be stronger than Kevlar, yet more flexible even than nylon. These extremely durable threads are fed through a special machine that wraps and stretches them into yarn. A yarn is a long continuous length of interlocked threads. The yarn, which looks like string or cord, is really the key to answering the question about how to make a bullet proof vest. The yarn is suitable for use in the production of textiles which are made by weaving the yarn in large industrial processing machines. By weaving the yarns in a special process, ballistic material manufacturers can produce the final sheet material from which bullet proof panels are made. These ballistic textiles are normally on rolls that can be 200 meters (660 feet) in length and look very much like the rolls of fabric you might see in a craft store. Using special patterns, multiple layers of ballistic material are cut at once by an industrial cutting press. Bulletproof clothing consists of a front and back panel that are slightly different in shape and size. The panels used in bullet proof clothing consist of many layers of the woven ballistic sheet material. A fixed number of layers of the sheet material (depending on the required protection level) are assembled to create a ballistic panel. In the case of Kevlar®, the layers have to be stitched together. The layers of ballistic material that make up the panel need to be put into a protective envelope. This envelope, also called a cover, can be heat-sealed or sewn in order to protect the ballistic material inside against moisture. In order to be held against the body properly, the bullet proof panels are fit into specially designed vests called carriers. A ballistic carrier has pockets designed to hold the ballistic panels in the proper position. It is also possible to add panel pockets to an existing coat or jacket. How to make a bullet proof vest? Now you know! It really is quite interesting and technology is allowing bullet proof clothing to become thinner and lighter all the time.